The Miami Heat escaped with a 105-100 win on Thursday over a San Antonio Spurs team that rested four starters in a move that will bring heavy penalties from the NBA. The Heat needed a late rally to take the win over the second-string Spurs, with Ray Allen's 3-pointer with 22.6 seconds left giving Miami the lead. Meanwhile on the other side of the country, the Golden State Warriors hung on for a 106-105 win over the Denver Nuggets when Andre Iguodala's 3-pointer on the buzzer was ruled out by officials, saying he released the ball just a fraction of a second after time expired. 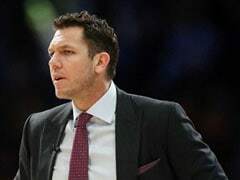 San Antonio played without Tim Duncan, Tony Parker, Manu Ginobili and Danny Green, all sent home to rest by coach Gregg Popovich, who said the move was in his team's best interest. NBA Commissioner David Stern disagreed, calling the decision "unacceptable," apologizing to fans and saying that sanctions against the Spurs will be forthcoming. 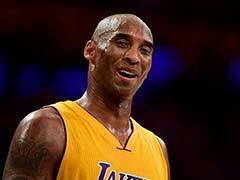 "It would have been great if we won," Spurs forward Matt Bonner said after hearing about Stern's statement. "We have faith in everybody on our roster. We think we have one of the deepest teams in the league." 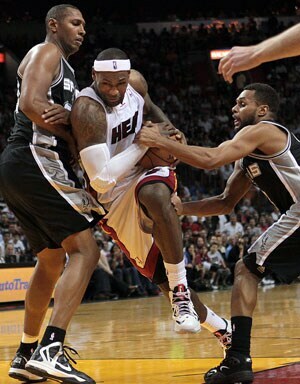 The Heat weren't disagreeing afterward. "We survived," Chris Bosh said. "And we won. They have a bunch of talented guys over there. I know that nobody's going to really give them credit, but they are a tough bunch." LeBron James finished with 23 points and Allen had 20 for the Heat who trailed by five points with 2:14 to go before producing a 12-2 run that turned the game. Gary Neal had 20 points for the Spurs, who finished a six-games-in-nine-nights road trip with a 5-1 record. "This month we've had 11 away games, after tonight. We've had an eight-day trip and a 10-day trip, and we're ending it with four (games) in five nights here. It'd be unwise to be playing our guys in that kind of a situation, given their history." The drama in Miami was matched in Oakland, with both Golden State and Denver celebrating after the buzzer, convinced they'd won the game. Iguodala received a cross-court inbounds pass and connected from the left wing with a hand in his face, and Denver players celebrated their apparent victory by running off the court toward the locker room. But the Warriors stayed put and waited on yet another review by officials at the scorer's table - then began their own cheers when officials ruled the shot came just an instant after time expired. It capped a wild end to the game, with a series of reviews by officials. They first went to the replay table to review whether Jarrett Jack had fouled Iguodala in the act of shooting, giving the Nugget three free throws with his team trailing by three points. After he clunked the third attempt off the back of the rim, Golden State's Draymond Green knocked the ball out of bounds to give the Nuggets another possession with 2.1 seconds left - and that play also went to review. Andre Miller's pass was deflected out of bounds, and officials went to the replay again before ruling the ball went off a Golden State player. Iguodala swished a 3 that would have won the game, but it came too late. 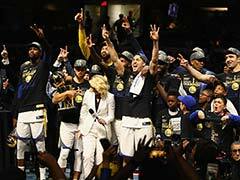 This win came at a good time for Golden State following a dramatic two days in which the Warriors and Andrew Bogut acknowledged the center underwent a more extensive microfracture surgery in April. Both sides are still unclear when the 2005 No. 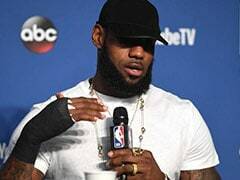 1 overall draft pick will be ready to return on his surgically repaired left ankle that has limited him to four games.